Spring 2017, you can experience a new user interface that will make day-to-day use easier on a mobile devices or desktop PCs. Updates include a more contemporary look and feel, better form factor use, and improved usability. Give project team members the ability to collaborate in real time throughout all phases of construction so your projects move forward—on time and on budget. Sage Construction Project Center helps teams reduce risk and drive efficiencies by automating the sharing, distribution, and tracking of all project-related details, including email communication, documents, approvals, costs, and more! Get timely, convenient, and mobile access to all types of contract and project-related documents, photos, files, and more. 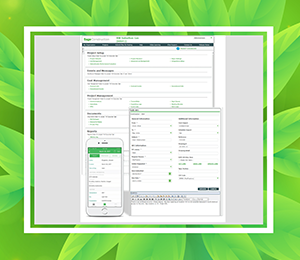 Using the Sage Project Center mobile app and their iOS device, teams can view and capture daily reports and photos regardless of where they are. Click here to learn more about the benefits of the Sage Construction Project Center Mobile Ap.